After a day of exploring Miami, I wanted to get a good Cuban Sandwich for dinner. 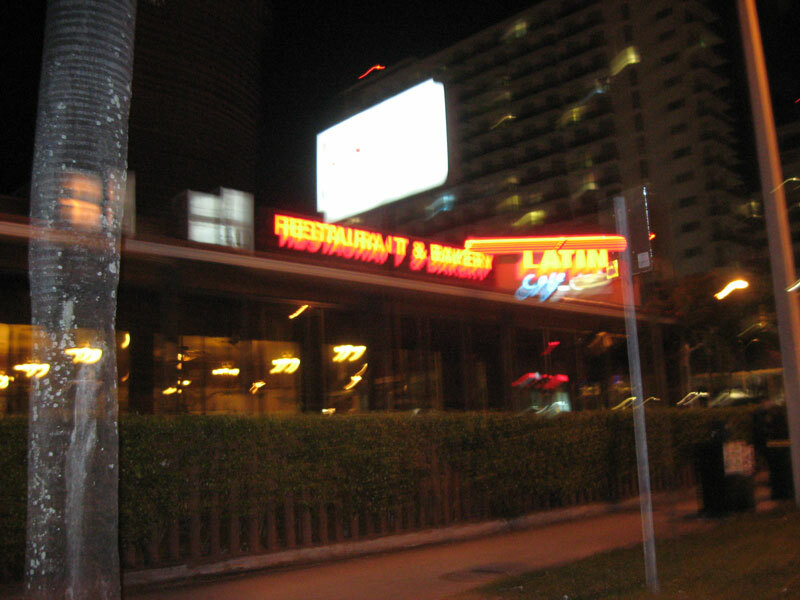 I ended up at a restaurant called Latin Cafe 2000 on Biscayne Blvd, just north of Downtown. They had a takeout window selling the desired sandwiches that looked like it was doing lots of business, so the Cuban sandwich prospects looked good. 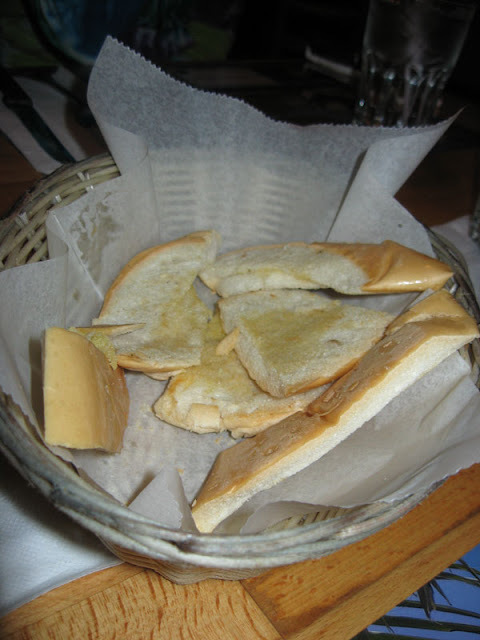 Once seated, we were served a basket of pressed and buttered bread by the very attentive waiters. I'm not much of a coffee drinker, but since this was at a Cuban restaurant, I'm including a picture of the Cortidito that someone else at the table ordered. 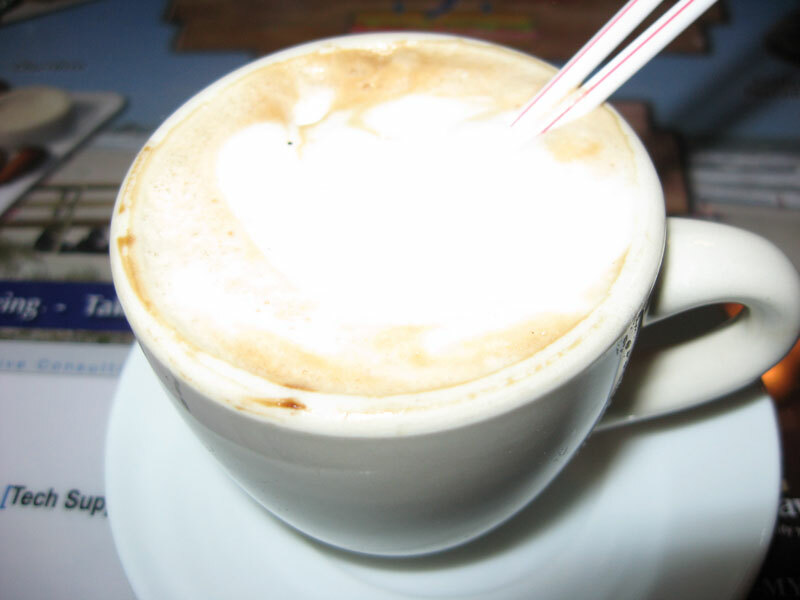 It was a really small cup of strong coffee with foamy milk on the top. It looked sort of like espresso to me, but I'm no coffee expert. 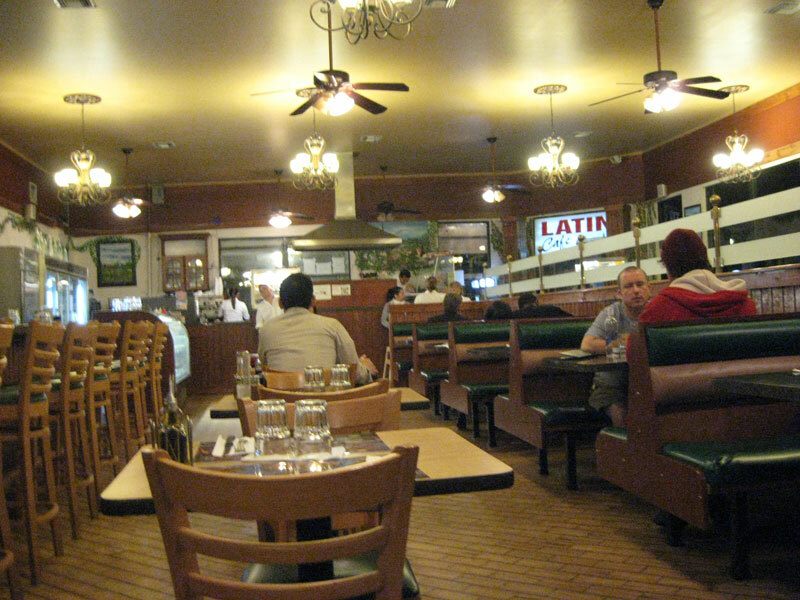 I walked into Latin Cafe 2000 thinking I was going to get a Cuban Sandwich. I sort of got distracted once I started reading the menu by all the other tasty sounding food. When I finally made my decision, I ordered the mystery meal at my table and got the Sopon Marinero. 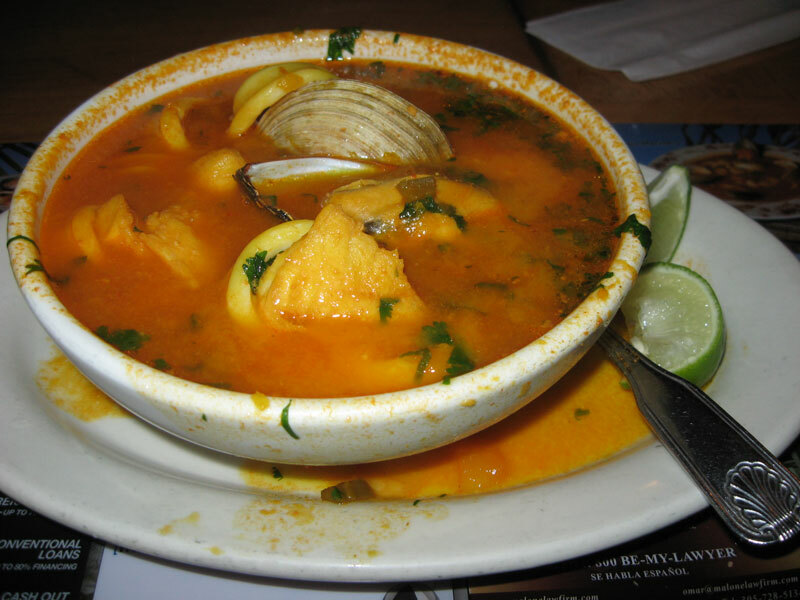 The English translation was kind of vague and said Big Seafood Soup. The waitress wasn't much more help at explaining what type of seafood was in the soup, but she said it was good, so I gave it a try. The soup came in a huge bowl and had a tomato based broth. The seafood consisted of calamari rings, mussels, clams, shrimp, and a type of white fish. With some fresh squeezed lime added to the soup, it was really tasty. The clams were kind of chewy, but otherwise I had no complaints. I'd gladly get this again! 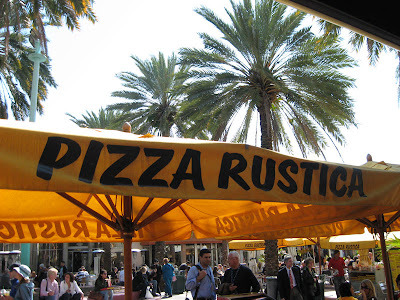 I ate lunch at Pizza Rustica on Lincoln Road in Miami's South Beach. Pizza Rustica had a huge selection of rectangular pies behind the glass, all being sold by the slice. 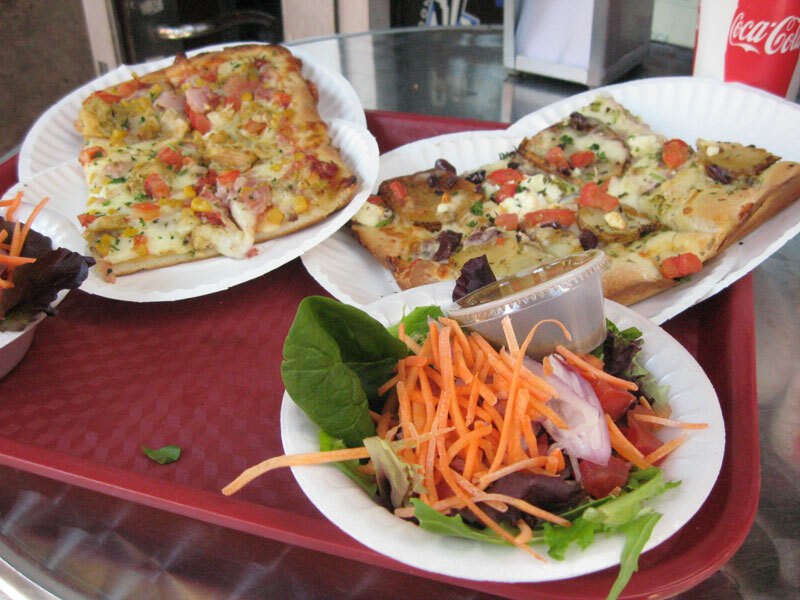 They called these Roman style pizzas, and were similar to a Sicilian slice with a slightly thinner crust and lots of toppings. There were so many varieties that it was actually kind of hard to choose what to get. 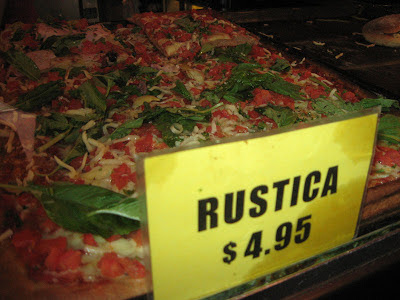 Pizza Rustica was busy and had a bit of a line to order, so I had time to make my decision. I ended up going with Pizza Rustica's special, which included a slice of pizza, salad, and drink for $9.50. 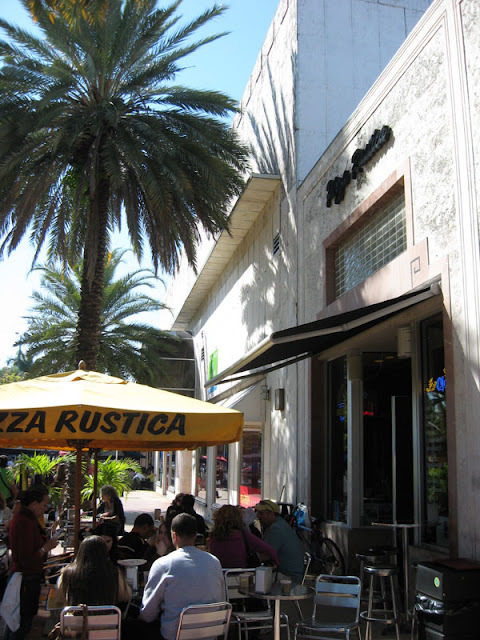 It was kind of overpriced for what it was, but Pizza Rustica was in the middle of the main drag of South Beach's touristy area, so the high price was kind of expected. My slice of pizza was reheated in the oven for a few minutes, and then I went outside to find a place to sit with my food. 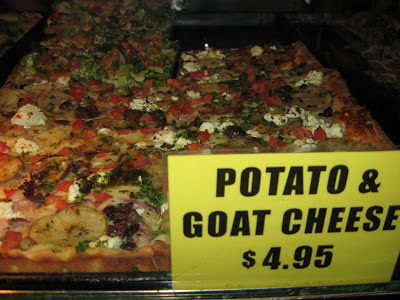 I picked the Potato & Goat Cheese pizza. 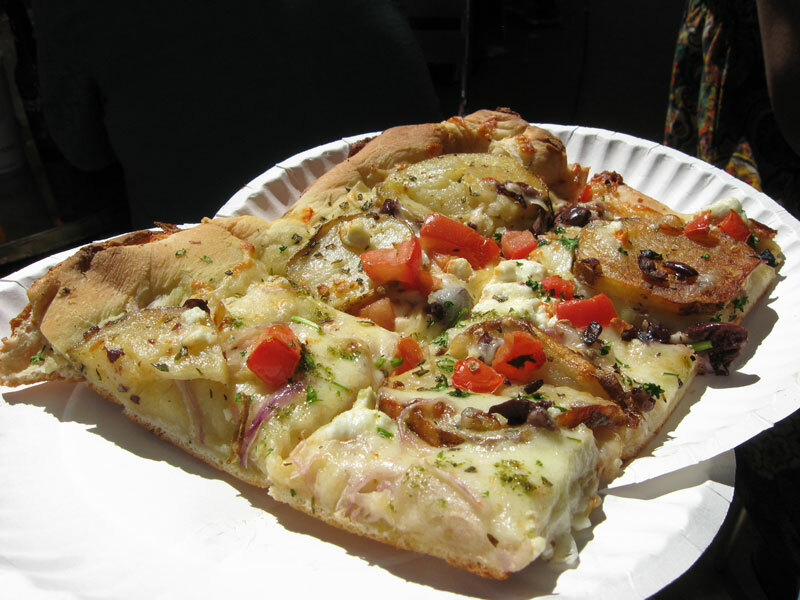 The large rectangular slice (then further cut into 6 smaller pieces) was topped with sliced potatoes, goat and mozzarella cheeses, kalamata olives, red onions, and tomatoes. Nobody ever seems to think potato goes good on pizza, but I've tried it on a few occasions (as well as making my own) and it's always been really good. 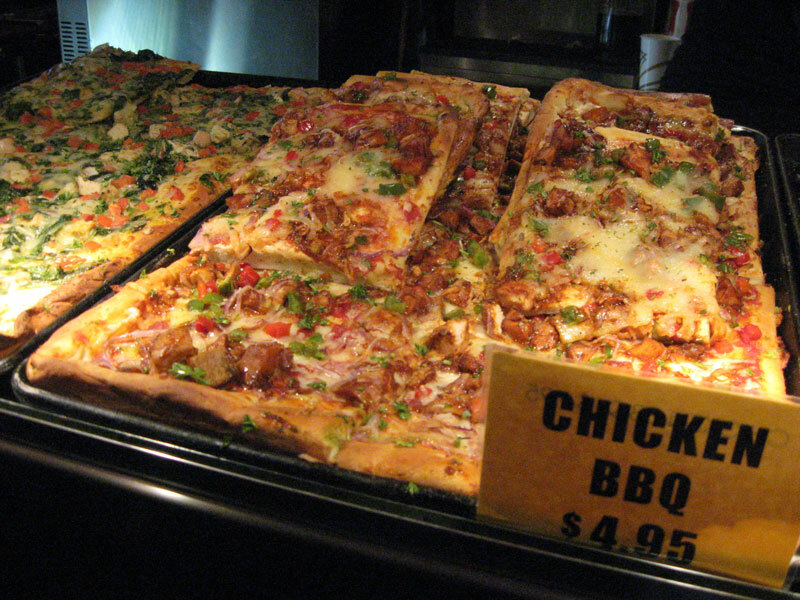 This slice continued the trend of good potato pizzas. I also did some trading among dining companions and got to try the special pie of the day. 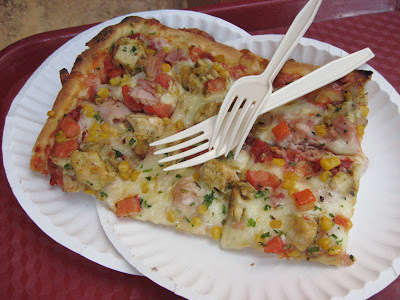 It was topped with chicken, Canadian bacon, corn, cheese, and tomato sauce. It was tasty, but I preferred my potato pizza. 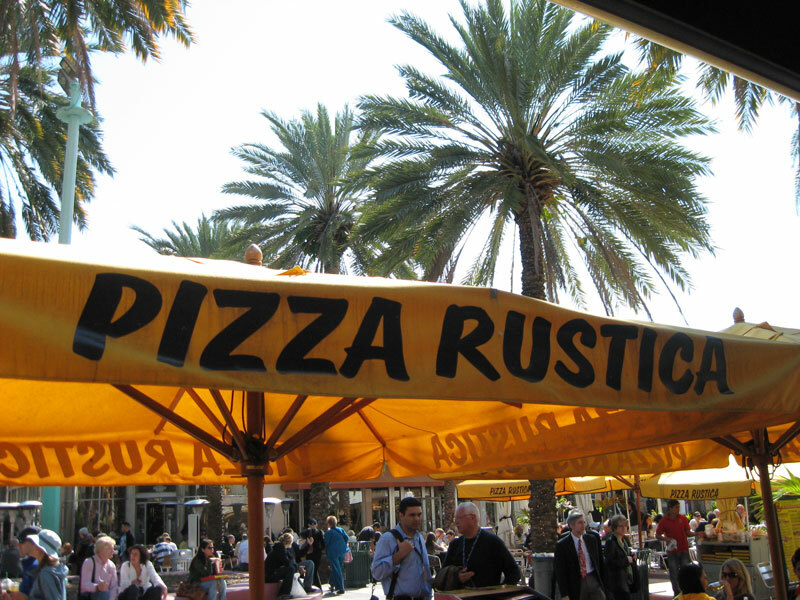 I'd gladly go back and give Pizza Rustica another try! 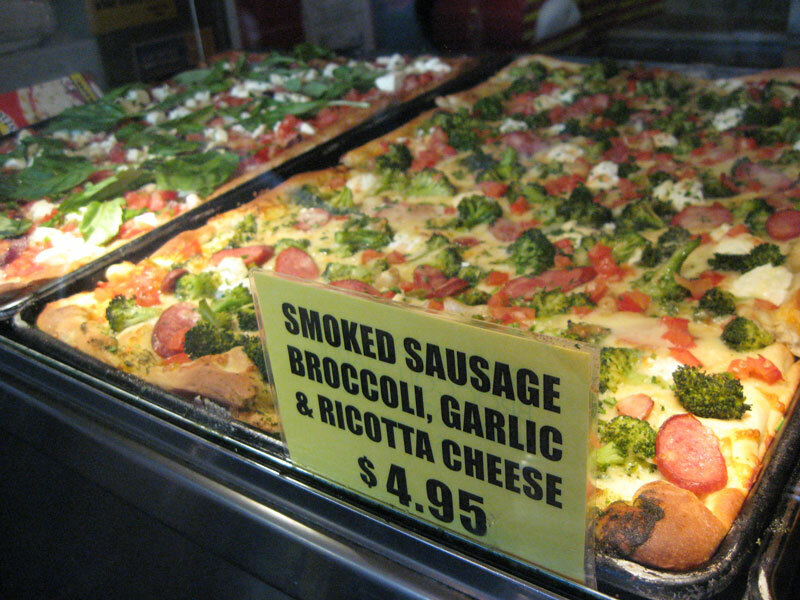 I love it when a pizzeria has a huge pizza selection like this place did! I've never had a bad pizza here. 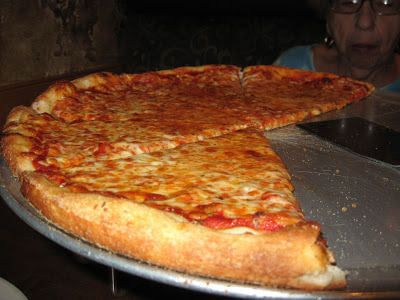 This NY style pizza is consistently good. The crust is nice and thin. The sauce has a great flavor and the cheese is tasty. There's always a perfect proportion between the crust, cheese, and sauce, and right out of the oven, the pie stays together. 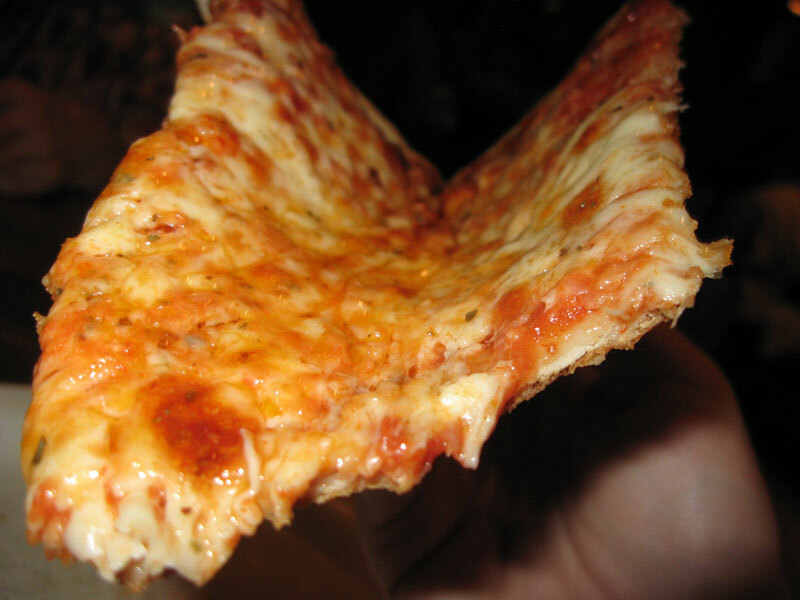 There isn't any of the cheese pulling off of the slice or sauce dripping onto the plate like sometimes happens with other pizzas. I ate lunch at a Chinese restaurant called May Sum in Orlando near the airport. May Sum had a lunch buffet going on for $5.95, so that's what I decided to get. They were running low on several items on the buffet, so the employees were nice enough to ask if we wanted anything else. They then went and made fresh food for the buffet, pretty much based on our requests. I had no complaints, it was all okay for a Chinese buffet. Nothing to write home about, but not bad either. I ate lunch at a new Japanese restaurant called Ginza Steak & Sushi located in Orlando's Mills-50 District. The restaurant is split into half hibachi and half sushi. I went with the hibachi. I had the chicken and shrimp lunch special for $8.95. The meal started with soup and salad, then the chef started cooking and fried rice, stir-fried vegetables, shrimp, and chicken followed. It was the standard show that goes on at these type restaurants, and the standard food for the most part. Noodles were the only thing that was missing that most other hibachi restaurants serve, but perhaps you get them with dinner. For the price, this was a whole lot of food. I didn't notice much of a difference in quality or portion size between what I ate at Ginza compared to what Kobe serves for almost triple the price. I'd gladly return. I ended my day at Epcot with a visit to the Morocco Pavilion to get some dinner. There's the Restaurant Marrakesh at the back of the pavilion that I have yet to try, but not for this meal. I got my food from the Tangierine Cafe. It's a fast food restaurant serving Moroccan food. Once I finished the lentils and couscous which both required forks, I ditched the plate and tray and walked closer to the lake with my falafel. Street vendors in major cities sell falafel for a reason. 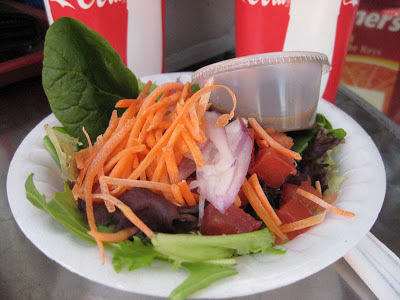 It's easy to eat on the go. The wrap was filled with the deep fried chickpea balls, lettuce, tomato, onions, and tzatziki. As far as theme parks go, Epcot is pretty awesome when it comes to food. What other amusement park is there where you can have good Chinese noodle soup for lunch, get free soda, and then end the day by eating falafel while simultaneously watching fireworks? I had dinner at the Brick & Fire Pizza & Pasta Parlor in Winter Park. 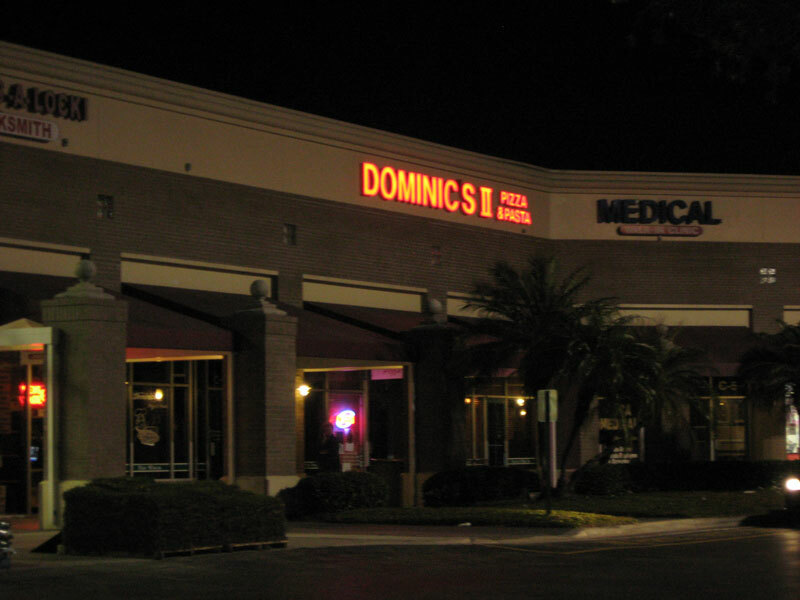 I had heard good things about the restaurant, so I was looking forward to giving them a try. The meal started with a Parmesan Flatbread appetizer. 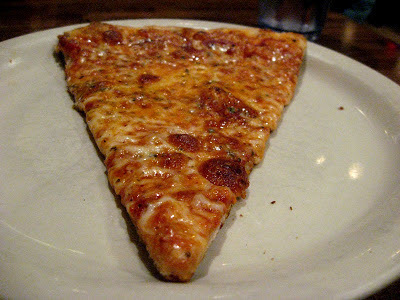 If I return to Brick & Fire, I think I'm going to have to try a pizza other than plain cheese. On their website, they have pictures of their specialty pies that look really good. 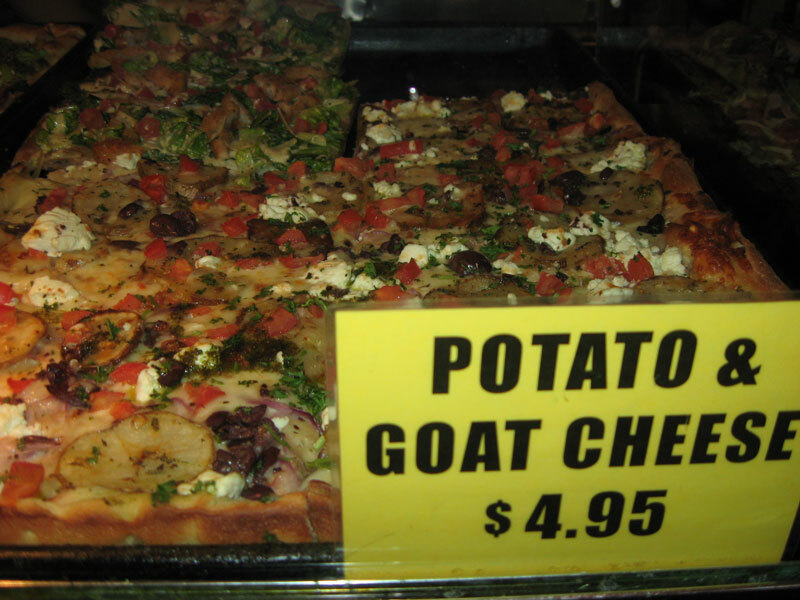 Based on those pictures, I'd try either a Greek Pizza or a Goat Cheese Pizza. Wynee's Bistro is the cafeteria at Florida Southern College in Lakeland. While visiting some people that attend the school, I ate here a few times. Unlike larger colleges where you have a choice of food and countless restaurants, it seems like at FSC you get to eat whatever is being served that day if you want to eat on campus. They did have good desserts. On another visit, they had a shrimp boil that was provided by Wynee's Bistro. It consisted of shrimp that were a huge pain to peel, some overcooked chicken breasts, potatoes, and pasta salad.